The Socialist Party sends our full solidarity and support to INMO members taking industrial action. A decade of austerity has made healthcare workers in the Southern health system face ever worsening conditions while pay has remained the same and the expectations placed upon them have only increased. The pay of nurses and midwives has remained lower than that of similar grades and has resulted in burnout due to immense physical and mental pressure and completely unhealthy and unsustainable working conditions. 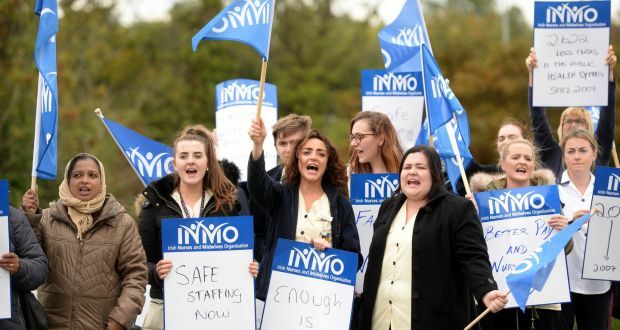 With acute staff shortages as a result, the HSE has paid vast sums to recruitment firms profiting from emergency agency staff on short and long-term precarious contracts, while denying their own staff any sort of improved conditions. This has developed the culture in hospitals in the South to being one of apologies and shame. Patients are left hopelessly waiting on trolleys, getting treated in corridors with no privacy and scant comfort the norm, and little to no chance of getting a bed during their stay unless they are very lucky. Health workers spend their days sincerely apologising to patients, who will reply that they know it’s not their fault and feel ashamed for putting nurses, midwives and other staff under stress by merely being sick and needing care. This is the most common experience in Southern hospitals and you would be hard pressed to find someone who would not be familiar with it, for either themselves or a loved one. The situation of these nurses and midwives is reflected in the conditions we have in our NHS, and is one that will only get worse unless we support all health workers in their fight for decent pay and fully-funded, free public healthcare for all.